A warm welcome and excellent facilities await you at Millhouse whether you are an independent traveller, family or group. It is particularly suitable for whole-group bookings and has recently hosted school trips, artist-retreats, watersports enthusiasts, bird-watchers and walking groups. 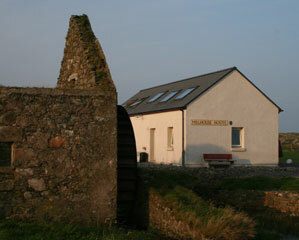 Millhouse consists of a converted barn with adjacent farmhouse, next to the old watermill at Cornaig. 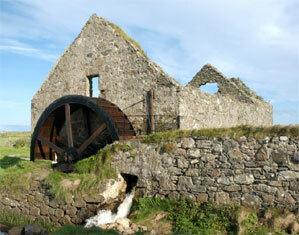 The water wheel has been faithfully restored and can often be seen in action during the afternoon. The location of Millhouse is just 200m from Loch Bhasapol and a ten minute walk from Cornaig beach. There is a wind surfing school, fishing and a bird-hide on the loch with surfing, other water sports, and golf all nearby. There is a resident RSPB warden on the island as well as a Ranger, who offers free guided walks around Tiree. Millhouse is also on the pilgrimage route linking the ancient chapels of the island. Bicycles are available for hire on a daily or weekly basis.